Synopsis: In the aftermath of a family tragedy, an aspiring author is torn between love for her childhood friend and the temptation of a mysterious outsider. Trying to escape the ghosts of her past, she is swept away to a house that breathes, bleeds…and remembers. Thoughts: There are very few directors out there that I can say I have trust in and Guillermo del Toro is right at the top of the list. Sure, his last effort was Pacific Rim a bomb-tastic and bombastic spectacle of effects and overly dramatic performances…but it still possessed a style all its own. 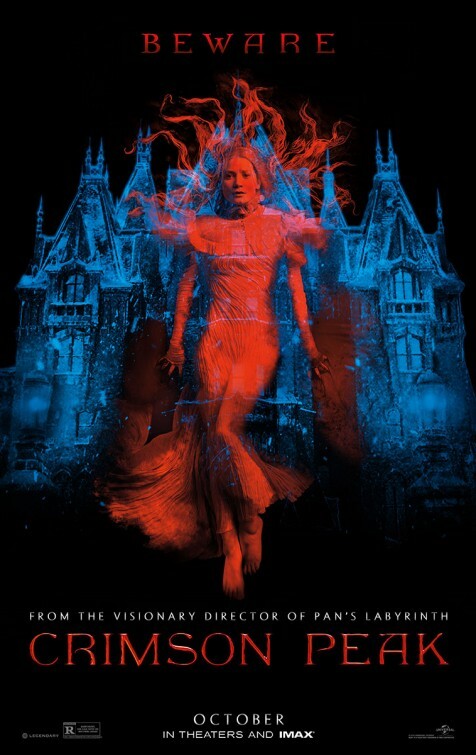 Our first, um, peek at del Toro’s gothic horror film Crimson Peak gave me the kind of warm feeling in my belly usually reserved for holiday festivities and anytime I catch Grease 2 on television. Modern audiences aren’t exactly clamoring for a Victorian set haunted house flick but they could be in for the fright of their lives if the finished product lives up to this impressive teaser. Featuring hot commodities like Jessica Chastain (A Most Violent Year), Tom Hiddleston (Thor), and Mia Wasikowska (Stoker) my interest is most definitely piqued. 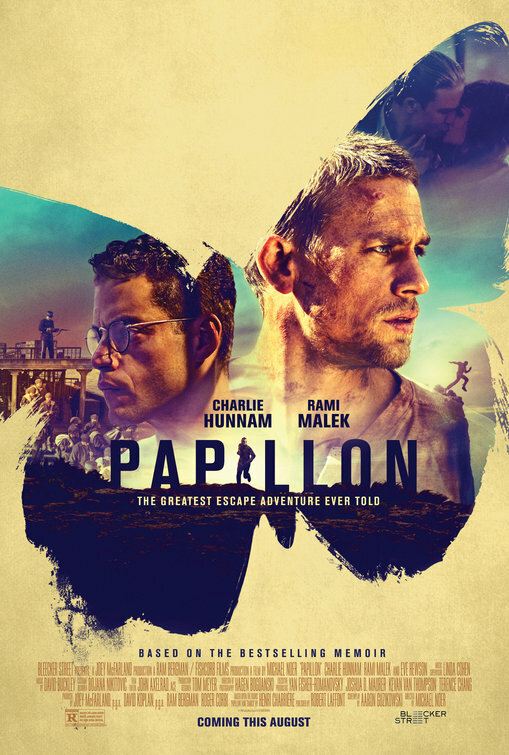 Synopsis: As a war between humankind and monstrous sea creatures wages on, a former pilot and a trainee are paired up to drive a seemingly obsolete special weapon in a desperate effort to save the world from the apocalypse. 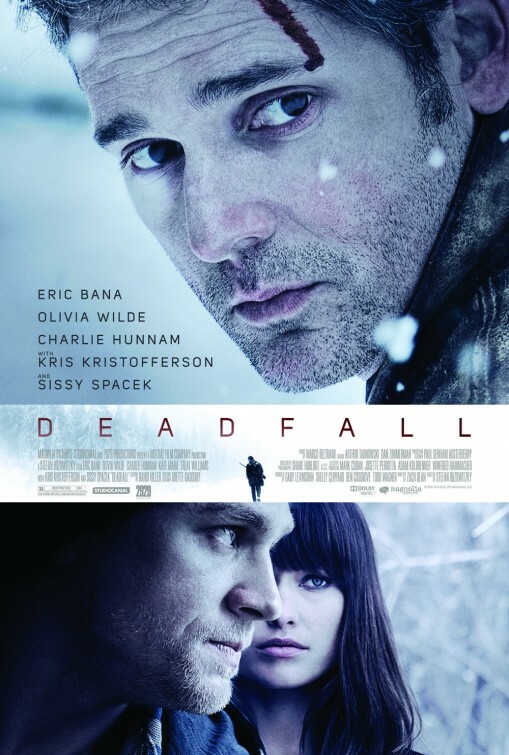 Review: So here’s a movie that had the potential to be a lot better than what it turned out to be. Director Guillermo del Toro has demonstrated over the course of his career that he’s a filmmaker truly interested in the heartbeat of a film. Though his works have always been visually arresting and skillfully created (hello Pan’s Labyrinth, Cronos, and both Hellboy movies), he’s not afraid to take the time to let the underneath of it all show through. Pacific Rim gets the trusted del Toro formula half right with some of the most impressively eye-popping visual effects you’re likely to see in theaters now. Add to that a production design that is realistic but not overly fussy and you have a movie that would be a slam-dunk…if you watched it on mute. 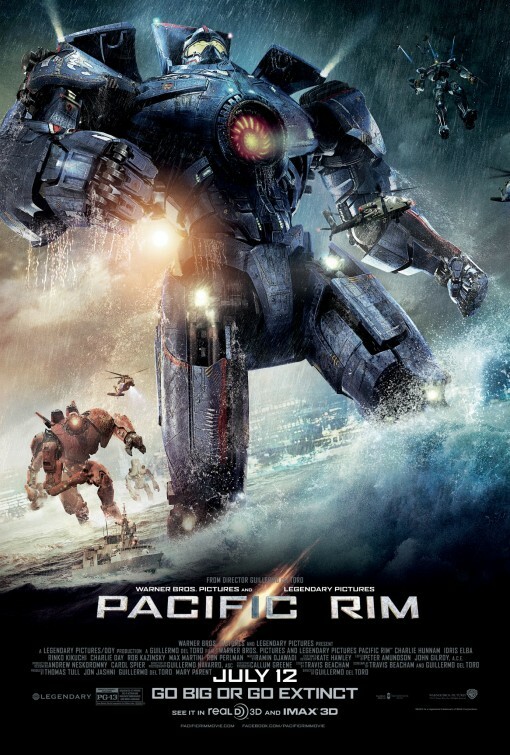 The problem with Pacific Rim is that it has no heart, no brains, and leaves the viewer feeling as hollow as the mighty mechanical titans that are created to fight creatures from the depths of the ocean. Credit should be given to screenwriters del Toro and Travis Beacham for devising a clever spin on the earth vs aliens formula that has been revisited by pictures big and small for over half a century. The lengthy prologue of Pacific Rim brings us up to speed on the last decade of war that broke out when a seismic shift in the middle of the ocean unleashed terrifying creatures that go on to wreak havoc around the world. Huge in size, our modern weapons were no match for their power so the world leaders created jaegers, battle bots that could stand tall enough to look these monsters in the eye and taken them down with a vast array of weaponry. How these are operated from within by two humans is best explained by the film itself (it’s kinda a bunch of hooey) but soon these jaeger pilots are seen as rock stars until the creatures begin to adapt and render the program nearly obsolete after a tragedy calls into question their effectiveness. Flashing forward several years, the program is re-started when a substantial threat of major invasion is predicted. Idea-wise, the film is a winner. Even writing about it here I had a small rush of excitement because it sounds like there is so much that a talented director like del Toro can do with it. And del Toro delivers the visuals with awesome results. The battle sequences (especially when viewed in IMAX 3D) are nearly overwhelming in their scope, size, and bravura. Even though much of these sequences take place at night and in the rain you’ll be able to follow each powerful battle royale between machine and monster. It’s also a shockingly bad film for acting. Let’s start with the best of the middling performances. Idris Elba (Prometheus) is a solid actor tasked weak material. I’m still waiting for Elba to be given the kind of role that will rocket him to the fame that he has the talent for. As the jaeger program director he has little to do but growl when questioned and deliver a sound byte ready inspirational speech near the end that feels like a revised version of the what Bill Pullman rambled on about in Independence Day. The rest of the international cast is a hodge podge that run the gamut from bland to sour. You simply couldn’t ask for a more vanilla leading man than Charlie Hunnam, an actor with zero going on behind his eyes. Paired with Rinko Kikuchi (a far cry from her Oscar nominated turn in Babel) the two are asked to create chemistry that not even the folks at MIT could assist in creating. Both actors provide some truly embarrassing performances and you have to wonder what on earth del Toro saw in them to cast them as the leads in such an important studio picture. As arguing scientists, Charlie Day (who comes off like the love child of Bobcat Goldthwait and Rick Moranis) and Burn Gorman seem like they’ve time traveled out of a sci-fi spoof of this film from the future. Lousy performances aside, this is one film that will be best enjoyed in a theater when you can be totally immersed in the world that del Toro has created. I can’t say the movie will work as well for home viewing so if you can overlook the disappointingly ordinary execution of a smart set-up and nearly an entire cast of poor performances you should try this one out when it gets to your bargain cinema. Synopsis: When an alien attack threatens the Earth’s existence, giant robots piloted by humans are deployed to fight off the menace. Thoughts: Though at first glance this may seem like a simple mash up of several other franchises, Guillermo del Toro’s long in the works Pacific Rim has debuted an exciting trailer that showcases the trademarks of the acclaimed director. With excellent visuals and a clear innovation of style, expectations are high for this summer 2013 release…and from what I see the buzz is warranted. Though he was on track to direct The Hobbit films before they hit production delays, del Toro shifted his focus to this and with the reviews that The Hobbit is getting…he may be glad he went for alien robots over hairy hobbits. Synopsis: Frank Bartlett has been tortured, embarrassed, and humiliated by his brother Bruce — usually on film — his entire life. Now that Bruce is finally off drugs and has turned his life around, things should be different. They are not. 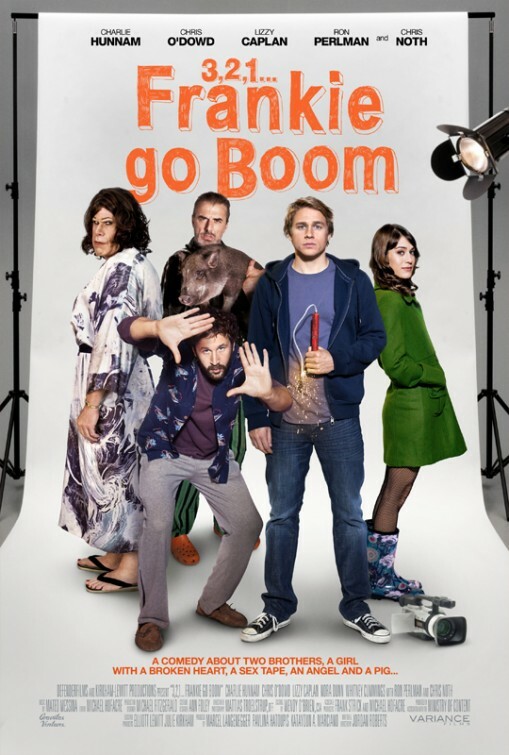 Thoughts: This indie comedy looks like one wacky affair but I’m intrigued to see how this type of film distinguishes itself from other similar themed arrested development laugh fests. The sight of Ron Perelman in drag is scarier than anything I saw in The Apparition but give the guy credit for never turning down a role with a challenge. The rest of the cast is an appealing lot and its low-budget vibe might work in its favor.